“Welcome to the craziest crush ever!“ Elizabeth greeted with this smiling statement on my first day (10/17/11), at 6am. Alongside fellow winery workers Cindy Cosco (Twitter, Winemaker, Passaggio Wines), Leo Almanza, Jorge Leon, Doris Garrido, and Rafa Alfaro, we crushed the annual tiny lot of Fiano, under the watchful eyes of Jeff, Elizabeth and Vineyard Manager Flavio Rodgriquez and Cellarmaster Eddie Lona. Fiano is an ancient Italian white grape from Campania in the South, and makes a fairly powerful flavored wine, with drier grapey fruit flavors and interesting nutty and floral aromatics. The winery team gets together to crush this small lot each year, helping to merge our efforts into one small, interesting lot of wine. 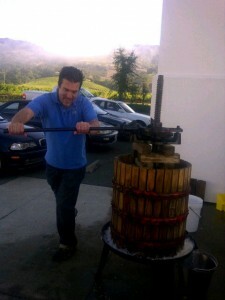 We used a small basket press to press out the little crush. Rounding out our vino bonding session was Doug Fletcher, Vice President of Winemaking for Terlato Wine Group. Doug has been in the biz a long time and is an outstanding source for winemaking/growing knowledge, with fascinating stories from his many years as a winemaker at Martin Ray Winery, Steltzner Vineyards and Chimney Rock. Good stuff. My job at the Rock has been and will be a bit of a wildcard, partly due to my experience in my day job at the lab bench. As such, this first week has been an extremely lucky and wonderfully fulfilling amalgam of vineyard work (sampling pH, TA and grams of acid; fruit integrity, ripeness and health), enology lab work (fermentation monitoring, berry and cluster weight), cellar work (tank and barrel inoculations, pumpovers, and punchdowns) and bringing in fruit on the crushpad (crusher/destemmer work and pumping juice into the tanks) and cleaning, cleaning, CLEANING. All of this…just in the first week! Elizabeth’s opening comment quite aptly described the 2011 grape harvest. We had late, big rains in June, regretfully well timed to cause some shatter and/or poor set (or pollination), on some of the grape clusters. 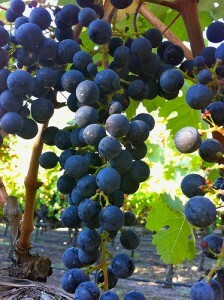 This means that the 2011 NorCal grape clusters look as though they are missing grapes, a result of these late rains. Then we had a lot of cool weather, just like last year, making the harvest much later than the average, up to 5 weeks in some parts of the state. Yet, we finally got some stable warm (not hot) weather later in the summer, which allowed for cool, even ripening and no hint of sunburn, dehydration, nor mold, as long as you cut back a lot of foliage to allow for this slow even ripening. Further rains and cool weather in early October enhanced the fears for mold. Fortunately, Elizabeth foresaw these possible weather outcomes early in the season and ordered the proper amount of defoliation, with great execution by Flavio and Rios Vineyard Management. Now we’re bringing in excellent Estate fruit, despite the somewhat ominous misty and cool weather that we had much of last week. 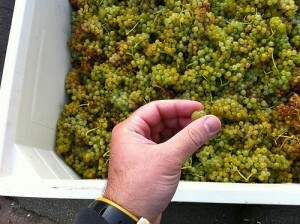 All that said, the day I arrived, crush finally took off and I dived headfirst into a very compressed harvest. Indeed, we brought in 150 tons of premium Estate fruit Thursday and Friday of last week, alone! Follow all of my adventures during this crazy sabbradical, by keeping up to date here at Vinopanion and following the #MFITV hashtag on Twitter, and all of the content that I’m pushing to my Facebook. The project also has it’s own photo albums on Facebook and Flickr. Lastly, all of the videos will be posted to my YouTube channel. Don’t be shy, I’ll add you to any profiles! 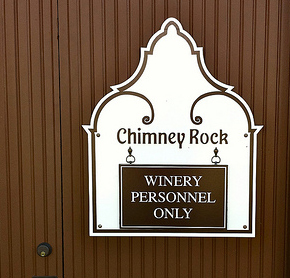 Below you will find a list of Chimney Rock wines on WineLog. I have reviewed some of these before my #Harvest2011 antics began, but I cannot, of course, review any while I am working for the Rock. Cheers! Thanks for checking out the article, buddy! Yes, they did fortunately. Actually never got stung. 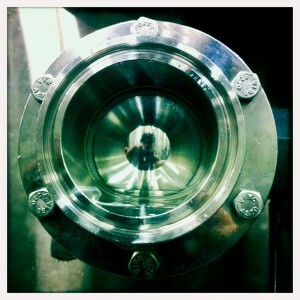 Now, the tanks and some of the other work that’s shown & talked about in the later articles…that’s a different story. 😉 Cheers!